Economics is rarely linked to violence in the UK’s mainstream media. Instead it is widely reported in terms of rational processes, statistics or the rising or declining fortunes of the political class. Economics as the means by which wealthy individuals and powerful institutions perpetuate harm on others is rarely perceived. Economic violence involves causing harm by denying those in need, of the economic resources required to live above a minimum threshold. When the media show a systematic indifference to engaging directly with the victims of economic violence, they help ensure that these crimes remain unrecognised in the court of public opinion. And austerity has given economic abusers free reign. Their pin-up boy until recently was Department of Work and Pensions (DWP) Minister Ian Duncan Smith. It is the representational practices of the mainstream media that repeatedly produce negative and derogatory images of the working classes, constructing them as problematic and dangerous in ways that both justify austerity and excuse economic violence. One area where the dominant media have failed to report on the pain, misery and fatalities associated with economic violence is the ongoing scandal of the Work Capability Assessments regime (WCA). These were until recently undertaken by the French IT firm Atos on behalf of the DWP. From the formation of the coalition government in 2010, the link between a rising number of suicides and other welfare reform related deaths was highlighted by bloggers, charities and disability rights campaigners. On their websites and in their reports we can glimpse the scale of the corporate and state brutality that continues to be meted out to vulnerable and sick (and sometimes terminally ill) people as they are sanctioned and/or pushed off Employment and Support Allowance and onto Job Seekers Allowance. Apart from the Daily Mirror, the escalating number of Atos inspired suicides and other WCA related deaths made only very sporadic breakthroughs in the dominant national media. Often, when they did so it was because of some action or report by an expert, a charity or a parliamentary committee. Local newspapers would report some cases where individuals had committed suicide but there is little evidence that the dominant national media themselves went out to find such cases, talk to the families, investigate in detail what was going on, assess the personal and emotional cost of the Atos/DWP regime, examine the needless waste of life and the deeply objectionable assumptions behind the policy: that if you cannot work you are a drain on society. A 2008 report by John H. McKendrick for the Joseph Rowntree Foundation, into the way the media report on poverty, found that photographic evidence of poverty was used only in 13% of reports. This invisibility was matched in the printed word where again in only 13% of reports on UK poverty, those actually experiencing it were included as sources for commentary. More typically, the reporting of poverty was mediated through the journalist, the representative from a charity or the voluntary sector or statistical data. This bracketing off of the actual experience and pain of austerity is crucial to fostering the indifference and ignorance that allows the growth of a culture of discipline and punishment for the crime of being poor. One of the most statistically striking but surprisingly invisible manifestations of austerity and economic violence is the growth in food banks. This growth has been driven by an almost sadistic drive to sanction people by the DWP. Almost as soon as the coalition government was formed in 2010, the number of foodbanks began to increase to meet the growing demand from people unable to feed themselves and their families. The Trussell Trust reports around one million people using their foodbanks, but they are not the only providers and there are many independent foodbanks, so the true figure is much higher. The official government response to this is that foodbanks are an example of the virtues of charity and the coming together of the Big Society. Only a political- and media-induced remoteness from the realities of life as a foodbank user can sustain the plausibility of this reheated Victorian ideology. A recent report in British Food Journal again found that the victims of economic violence are not prominent in press articles about foodbanks in the UK. Food bank users appear in only 20% of the articles sampled. The Daily Mail bucked the trend away from hard hitting investigative reporting and sent an undercover team to expose the scandal of foodbank Britain. Unfortunately, the title of the article was: ‘No ID, no checks… and vouchers for sob stories’. The Mail made the shocking discovery that some claimants were daring to use foodbanks more times than the maximum nine times a year that the Trussell Trust allots to its claimants. Presumably the reporters did not realise that a few days worth of food times nine visits covers rather less than the 365 days there are in a year. Once again they also failed to speak to any food bank users. In contrast to the Mail’s heroic efforts to deepen and extend their readers’ legendary ignorance with scare stories of fraudsters, a 2014 report by the Child Poverty Action Group, Church of England, Oxfam and the Trussell Trust found that people used foodbanks as a last resort. Most recipients described using foodbanks as ‘embarrassing’ and ‘shameful’. The experience of austerity is different for different classes because the conditions under which they live their lives are different. The dismantling of social democracy and the rise of neo-liberalism breaks down the communicative channels between different groups in a class divided society. The gulf gets larger as does the mainstream media bubble. Discussions of class no longer include working class people, their hungry children or those living in tents in the woods. Instead they take place within ideological spaces that are dominated by the middle class and are mediated through middle class perspectives. The result of this is that for the majority of people it is assumed the picture they are being painted of a bloated welfare state and a workshy, benefit cheating working class is sufficiently realistic and true to life. 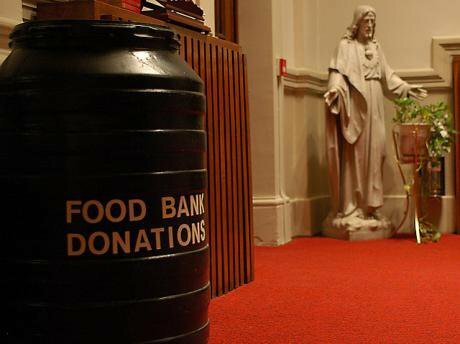 Where are the photo reportages of foodbank users in modern 21st century Britain? Where are the news reports? Where are the documentaries? They are nowhere to be seen in the mainstream media. Instead they turn a blind eye to the institutionalised economic punishment beatings.